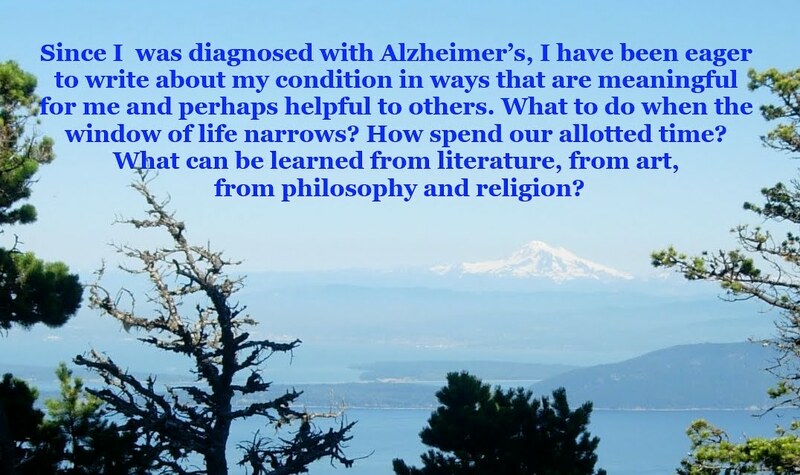 Living in Somerville, Massachusetts, one of the densest cities in the United States, I’ve been spared somewhat from the difficulties of my Alzheimer’s cohorts are experiencing. I gave up my driving license in the fall of 2016, but I can still get around on my bike, or on foot, to any of three supermarkets, each of which is within a 20-minute walk from my house. Of course, the weight of my cargo has to be very limited. Even if I had a milk crate on the back of my bike, the amount of my groceries would be limited. Instead, Paula and I share the grocery shopping at the Somerville Market Basket, where prices are a good deal lower than the other supermarkets. Last week, I interviewed my cohorts Mike Belleville and Jane Callahan. The three of us were each diagnosed roughly at the same time, in 2015. Mike’s diagnosis was changed to Lewy bodies disorder, another form of dementia. And Jane went through a similar process, in which her diagnosis was changed to posterior cortical atrophy, a form of dementia that affects visual processing. When I asked Mike what he most missed about driving, he quickly replied, “Having the independence to go whenever I want to go.” At the time of this interview, Mike’s father was in the hospital, but Mike had no practical way to visit him. Mike likes to go fishing with his friends, but these days he has depend on the availability of his friends to drive him. Mike uses Uber, but is somewhat wary of the service. “Is this the right car?’ he said with a chuckle. “If I am in Boston, it can be confusing. You know, there are so many cars.” Mike added, “The app has changed.” And when people with dementia have to adapt to a novel situation, it can be challenging. Jane’s problems may be more challenging, because of the nature of posterior cortical atrophy. It’s not a standard feature of Alzheimer’s. I wasn’t at the State House that day, but the conditions sounded awful, for Jane, in particular. The State House is an ancient building, and trying to find your way to the right hearing room on your own can be challenging. And you don’t have to have dementia to get lost within this ancient edifice. But, according to Jane, the signage met her needs. What she wants is the freedom to be spontaneous. As Jane commented, “There is still a loss of freedom. Your loss of spontaneity is not valued. You can’t just say, I want to go to the museum. And you have to be very specific. ‘Am I going be to standing out in the rain?’ It’s the same way with Uber. Sometimes the drivers are inexperienced, and they don’t know the area. And sometimes they don’t.” In what sounds like a GPS glitch, the Uber driver ended up in the Boston neighborhood of West Roxbury, about as far you can travel and still be in Boston. That’s one of the drawbacks of GPS. The technology is not infallible. I learned that in Washington, D.C., a few years ago. But that’s another story. The first time I heard the term “inflammation” in the context of Alzheimer’s was when a cousin of mine mentioned it a couple months after I was diagnosed with Alzheimer’s. At first, the topic seemed exceedingly vague. Inflammation? Well, yes. The phenomenon is commonplace. At the end of the holidays, I experienced a freak accident. It was a day of mild weather, and Paula asked me to drag our Christmas tree further down our driveway. The unseasonable weather prompted me take off my gloves. A moment later I was reminded of World War II movies in the Pacific, when Japanese soldiers were purported to torture U.S. soldiers by jamming slender bamboo reeds beneath the fingernails. By the next day, during a meeting Paula and I was attending, I had to recuse myself for a time. No one on hand had any painkillers on hand. The next day I visited my doctor’s office, and one of the nurses was almost gleeful with the quantity of pus I produced. A recent Time magazine article began with the curious question, “What does a snubbed toe or a splinter in a finger have to do with your risk of developing Alzheimer’s, suffering a heart attack or succumbing to colon cancer?” This rhetorical question is at the heart of cellular inflammation. Before the advent of antibiotics, anyone who developed a serious infection had a fair chance of dying, or sustain damage to their heart, as was the case of my paternal grandmother, who died in middle age. Do a search on “cellular inflammation,” as I did, and you are likely to be presented with a concise definition, provided, most likely, by Google: “Cellular inflammation is the type of inflammation that is below the perception of pain.” What it does is disrupt the hormonal signaling at the cellular levels that leads to increased fat levels,” which can lead to chronic diseases, including obesity.” But the most salient information I retrieved was supplied by Dr. James Ellison, of the Swank Memory Care Center. “Our understanding of diseases often follows a predictable journey,” Ellison noted. “First, we begin to understand that a group of symptoms occur together”—a simple example is that a sore throat typically leads to a cough. But, “In the case of the more severe sore throat, its potential for leaving serious heart damage, was understood before its cause, strep infection, was made possible by diagnostics. Once a cure is in place”—Ellison is an optimist—“researchers may be able to design a specific treatment, but not always. We know the antibiotics are likely to defeat strep throat, but we still have no cure for the common viral sore throat.” This threshold must be frustrating to scientists. Concluding, Ellison writes, “a current explanation of this failure focuses on the different effects that anti-inflammation treatment might have at different disease stages of Alzheimer’s.” This sounds reasonable, but perhaps a bit pat. The “cocktail” approach of medicine, which came into vogue when it became clear that Magic Johnson, after the former NBA superstar was diagnosed with HIV in 1991, defied expectations of his early demise. But when I am honest with myself, I feel that a real breakthrough remains quite down the road, perhaps another full generation. Could cellular inflammation be the cause of my Alzheimer’s diagnosis? Nothing else, so far, checks out: no hint of Alzheimer’s in my family tree. No concussion serious enough to put me in danger of the much-feared “CTE,” short for chronic traumatic encephalopathy, which in recent years have disturbed many former football players. I will probably never know. A couple of years ago, I purchased a large bottle of turmeric capsules. I’d heard that Alzheimer’s rates in some parts of India are a good deal lower than in North America. Unfortunately, the website I visited implied that curcumin, the active ingredient, could only be realized by regular eating subcontinent food. And I do like Indian food. But it was immediately clear that the rest of my family, or even myself, would be unwilling to make a radical change in diet. I also recall, when Paula and I visited Innsbruck, Austria, in 1991, one of the most striking places on earth, I threw up violently, presumably on account of Indian food. Belatedly, I grasped that turmeric capsules could be helpful. In January, an article in Forbes, by Alice G. Walton, described how turmeric could help people with cognitive problems. “Curcumin’s anti-inflammation, anti-amyloid, and possible anti-tau properties may offer neurons protective benefits,” Walton wrote. (Tau and amyloid plaque are the two significant features of Alzheimer’s. Tau presents as “tangles,” amyloid as “plaques.”). And, significantly, recent studies indicate a link between curcumin consumption and lower rates of Alzheimer’s disease. While the research has been described as promising, “initial placebo-controlled trials have yielded negative results, perhaps because they used forms of curcumin with limited “bioavailability”—the proportion of a drug or herbal supplement that is efficacious. Apparently, the only downside of the trial was abdominal pain, presumably caused by the spicy diet. In a less august tribune, the U.K. website “Just Vitamins” makes the blunt claim that Indian food “can break down amyloid plaques.” If this proves to be true, this would be encouraging news, but information highways are littered with the carcasses of projects that died from lack of money, or lack of relevance, or both. In the meantime, I’ll be popping my turmeric capsules, and making sure I don’t gag on them on. My ruler indicates the capsules are just a shade over 2 centimeters. The claim, of course, is that curcumin can break down amyloid plaque, one of the two facets of Alzheimer’s. (The other is “tau,” which presents as tangles.) And, if you haven’t noticed, I don’t have much of a background in science. So I still have things to learn about my condition. Make that a lot to learn. In a future post, I will take on cellular inflammation, another topic that may leave me treading water for a while, until I get my bearings.